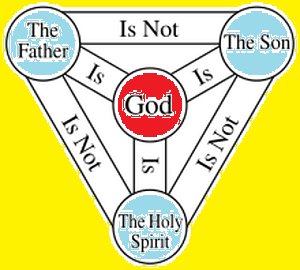 The Old Testament mentions the teachings of Trinity. In the work of God the man, he says: "Let us make ourselves like our image and appearance" (Genesis 1:26). It is understood that the father and the Ministry are using the plural pronoun "we". In rendering his judgment, God wants to establish a tower to heaven, he says, "We descend and confuse us in some languages" (Genesis 11: 7). At the call of the God of the prophet Isaiah, he said, "Who will I send and who will come for us?" Isaiah 6: 8. Isaiah the Prophet said, "God sent me with his Spirit." Isaiah 48:16. But there are good scriptures in the Old Testament, which means there is more than one person in God, so these fares need to be understood in the New Testament by God's revelation. The church teaches that there is only one God, but in this one God has three different person: Father, Son and Holy Spirit (1 John 5:7). God has no origin. The Son from God the Father is God(John 1:1,14). The Holy Spirit is coming from the Father and Son. Each of them possesses all the conditions or characteristics of the existence of God. The idea of ​​a god is three people, why the three different people are part of the mysterious Trinity, and the mystery of the Trinity is not completely understood by our minds. But the doctrine of the Trinity is understandable because it is necessary to know the meaning of the words used in the interpretation of this doctrine. The nature is the essence of one thing. This is the definition of what is called. This role also creates a function that is the result of a person's role in human nature. The character of God is itself "self-existent" and does not depend on anything else. The added virtue of the existence of God is his power, all knowledge, the end of everything, and the beginning and the end. This is what the Father, the Son, and the Holy Spirit have in common. "Man" means intuition and will. The Father, Son, and Holy Spirit are always familiar with their will and will therefore be called they're only or one. Let us also notice that God shows himself in a timid way. The Old Testament teachings of the Old Testament imitate God. We also like it. It is unprepared to reveal the mysteries of the Trinity as they recognize the many gods around them, and thus the great possibility that it will be misunderstand that there are many gods in the three Gods. Related: How to Explain the Trinity to a New Believer?